Sometimes it takes the innocence of a child for people to realise their own foolishness. The apparent naivety of youth is easy to dismiss… but often it reveals a view of the world that is unburdened by the twisted and ambiguous ideologies of adulthood. In Mafalda, a young girl who hates soup, Argentines once found an insightful commentator of social events. Mafalda first appeared in a comic strip in 1964 when she was six years old. Despite her age, she was a child with a big heart and an awareness of the world she lived in. She cared about humanity and world peace and, in her own way, she struggled against the problems she saw around her. She also liked The Beatles… but I guess everyone did back then. For ten years Mafalda appeared in newspapers in Argentina until the cartoonist, Quino, stopped the series. In those ten years she had gained only five years of age but a huge following in Latin America. Readers were drawn to her in a way that, in this region, had never been seen before with a cartoon. She spoke to a community that needed to question the state of the world but lived in a time when it was safest for a fictional child to do the questioning. As you’ll see in these examples, Mafalda looked beyond the usual primary school problems of muesli bars, skipping ropes and boy germs. She tackled the Vietnam war, nuclear weapons and the meaning of life. The influence of Mafalda grew over the years that she was published in Argentinian newspapers (and in compendiums of the cartoons). It got to the point where she was even influencing the dietary habits of children. I mentioned earlier that she didn’t like soup, a recurring theme in the comic strip. Well, a survey of children in Argentina aged 7-11 found that only 5 per cent of kids who read Mafalda regularly said soup was a favourite food while 55 per cent of kids who never read it gave soup the thumbs up. These days the young social analyst is officially retired, although collections of the cartoons are still published. She would be in her late twenties if the ageing process stayed at the same rate – but the Argentines don’t like to think about that. 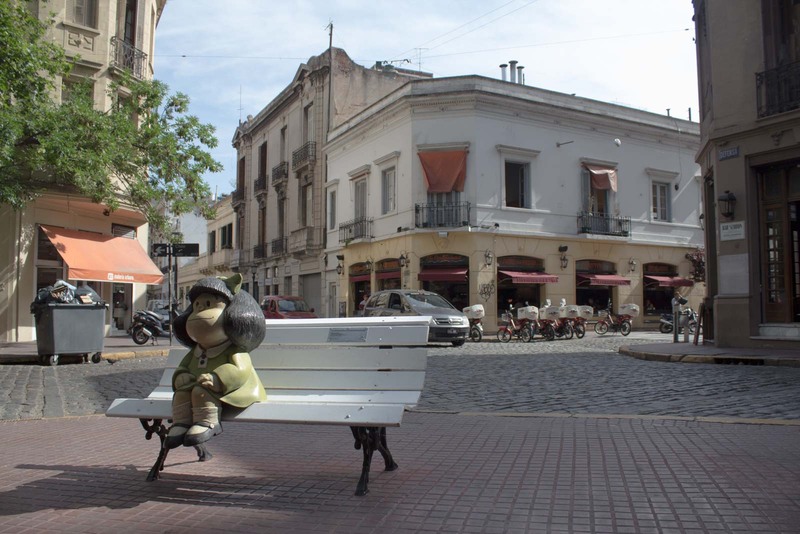 A life-sized statue of her as a young girl was installed two years ago in the neighbourhood of San Telmo in Buenos Aires, outside the old home of the cartoonist Quino. 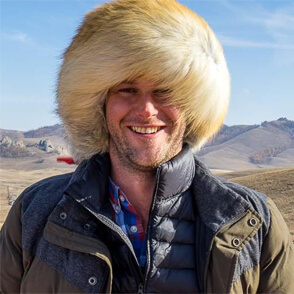 It’s become a popular tourist attraction in the city and every day, no matter the time, there are always people waiting to have their photo taken with her. It’s strange that almost 40 years after Mafalda disappeared from the daily pages she still elicits such a response. Perhaps it’s from memories of her bravery and strength in fighting against the malevolent forces of a time caught between a world war and a cold war. Or perhaps it’s a longing for someone to stand up to the villains of today. Argentina, like much of the world, is slipping into an economic black hole where more is being sucked in than could possibly ever come back out. Now is a time when the simple truth, however naïve it may seem, is what people need to hear. And perhaps they need to hear it from a child like Mafalda. Malfalda is great, I love her. I think her influence is pretty impressive. Yeah, I’d never heard of her before I got to BA and someone told me the story. It’s amazing how she shaped the views of so many people. I’m actually not sure – and I can’t find much information about why. I wonder whether anyone else here knows the answer? I heard bits and pieces, but I didn’t know the whole story before. Nice job! 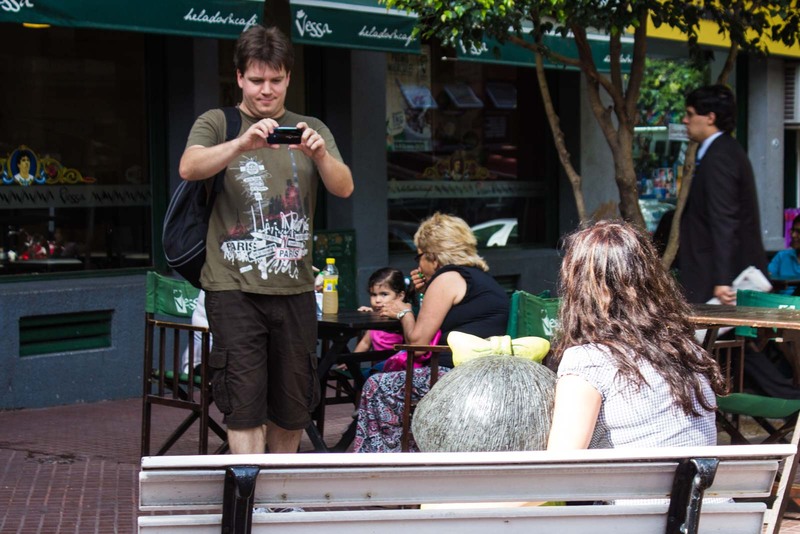 I didn’t know the whole story before either but it was incredible to see so many people still wanting to have their photo with her statue in San Telmo! I had never heard of Malfada either–thanks for the info. Sort of reminds me of Charlie Brown–and icon! I’ll look for her in BA! Thank you for the post. Based on my conversations with people from various Latin American countries, I believe Mafalda is well-known and loved almost everywhere. Very true! Her reach extends well beyond Argentina. I guess it shows that some issues are relevant to everyone! What’s interesting about Mafalda is that she’s timeless. Anyone in the world will understand the issues she touches in the strips. It says a lot about the world, doesn’t it, that issues in one country from decades ago can still be so relevant to so many people today. Is it because Quito captured it so well… or is it because the more things change, the more they stay the same? My sister introduced me to Mafalda when I was in High School. Mafalda’s message is so strong that I did an analysis for a class about its social and political messages. I really enjoyed reading all the strips! That’s great you got to actually study the comics. There’s so much in them that is still relevant to the world today. It’s interesting how the ideas can be applied across generations and continents and still ring true. I’d like to know where you got the English version of Mafalda. I’ve looked for many websites and bookstores; however, nobody has it. Hi Susy. Sorry I can’t be of much hope – these images just came off the web. Perhaps someone had just translated these particular ones. I’ve never seen a full English book either. Hello, The translation does exist. I saw Mafalda in English in a bookshop in Montevideo, Uruguay. I don’t remember any details of publishers though. Keep on looking for it. Hi Susy, you can find the English Editions of the books in Amazon. The ones from 1 to 10 are just great. I recall reading the comics when I was just a little older than her, I knew every story and I re’read them again and again. Priceless. Hoy Ayer y Siempre!! Dear Anglofiles the fact that you have not heard/read about her doest mean anything ,..other than that! She is a hero of SouthAmerica , Spain and all those clever enough to get her…Today Yesterday and Always this girl and Quino nail it! With rigor and with love! ..I could write a whole page..but just Thanks to Quino Hoy Ayer y Siempre! Thank you for such of great post! 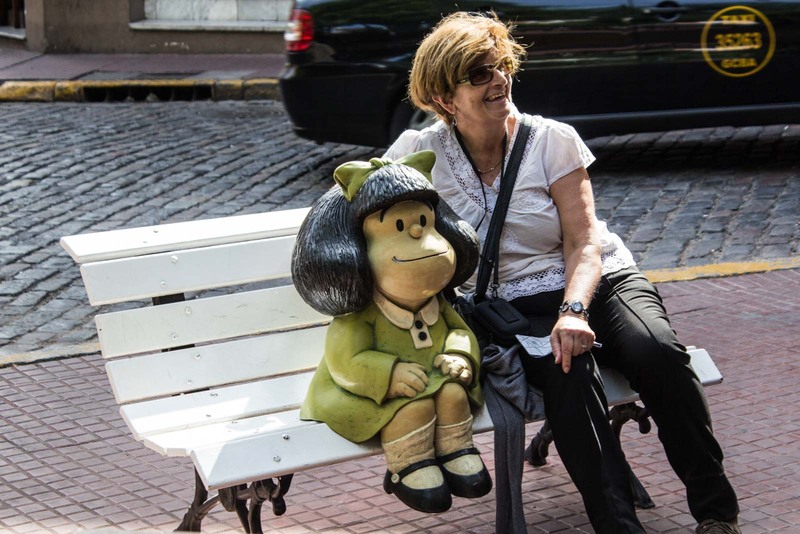 I love Mafalda I read many of her amazing stories when I was young, now 46 I am going to Argentina as a guest curator for their 4th biennial and part of my project is to honor Mafalda. I really love Mafalda!!! She is and has been my icon from my childhood. I give activities to my students in which they have to relate their tasks with her such as a daily routine, or whatever. I’ve had the pleasure and the gift to meet Quino in person once on my summer holiday. It was funny because I haven’r recognize him . At that time my children were little kids and I was trying to take care of all them three in Mar del Plata when a couple approached us and with a very kind voice , the man said to his wife – ‘… Look ! Twins!! !, how nice!!!! We’ve been talking for some time and when they were saying good bye to my husband and me , he kindly said , just in case, I’m Quino!!!! 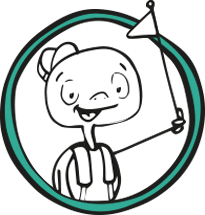 What is Quino’s real name?